International (MNN) — Changing lives by introducing the Gospel in a familiar language is important, but so is taking a step back and appreciating the work that has been done to get there. 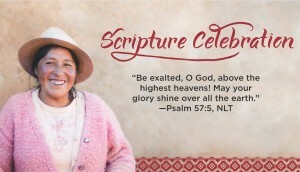 Twice a year, that’s what Wycliffe Bible Translators USA does. This week they held their most recent celebration, which honored the translation of 16 new Scripture portions in the last six months. 16 portions may not sound like a lot, but it’s actually allowed 13 million people, who didn’t have the Gospel before, to have access to Scripture. This year’s celebration differed a little from the rest. People from all over the world, whether they were employees of Wycliffe or not, could join in on the party by watching a live stream. “One of our staff members joined us from Manila. There were people that joined us from Washington D.C. We had people from around the world that were actually joining us online for the celebration,” says Wycliffe’s Bob Creson. Around 200 people participated in the live stream because they wanted to encourage and applaud the work being done. With Wycliffe’s work, they’re looking to establish God’s Kingdom on Earth. And the best way to lead people toward the Kingdom is by giving them the best guidebook of all: the Bible. There remain around 1,800 Scripture translation projects to be started. It sounds like an expansive amount that couldn’t happen for decades. But in all reality, around 150 to 160 Scripture translation projects start each year. And, Wycliffe has the dream to have a project started in every language in the next 10 years. You can sign up to join Wycliffe’s prayer team for Bibleless people groups. Once you sign up, you’ll receive information and updates on your group! Keep going!!! Wonderful news about what God is doing through you!!!! @BlakeCzirr: I had heard “The Children’s Crusade” was supposed to happen just before “Prelude to Schism” (so after Fear itself, but before Shattered heroes, Regenesis and AvX). What do you think about it ?